Crunchy pralines embedded in milk chocolate, with cornflakes and almonds. 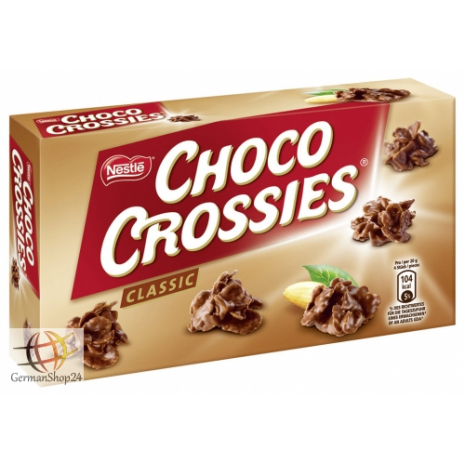 Crunchy cornflakes and fresh almonds embedded in smooth melting milk chocolate – that are the popular Choco Crossies Classic. They are always the right choice for lovers of milk chocolate and ideally suited to ring in the relaxing evening. Thanks to the two sealed bags each with 2.65 oz the delicious crispy pralines always remain fresh in the folding carton and make the portionability easier. 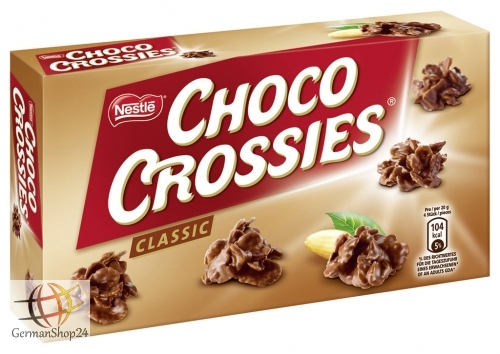 For all lovers of dark chocolate, the Choco Crossies Dark are a welcomed variation. Deviations are possible between the respective product information of the products as well as their illustrations. The content information described by us is temporary and can be changed at any time by the manufacturer. Please always note the content information on the product packaging or on the product. Please also note, that in general foods are non-returnable! Sugar, cornflakes (corn, sugar, salt, BARLEY MALT EXTRACT), cocoa butter, cocoa mass, SKIMMED MILK POWDER, ALMONDS, WHEY PRODUCTS, BUTTERFAT, emulsifier sunflower lecithins, natural vanilla flavor. Zucker, Cornflakes (Mais, Zucker, Salz, GERSTENMALZEXTRAKT), Kakaobutter, Kakaomasse, MAGERMILCHPULVER, MANDELN, MOLKENERZEUGNIS, BUTTERREINFETT, Emulgator Sonnenblumenlecithine, natürliches Vanillearoma.